Adrian Tuck, CEO of Tendril Networks, spoke to a phalanx of VC investors on Wednesday. The meeting was at the offices of VantagePoint Venture Partners in San Bruno, Calif -- a semi-regular get-together of the Cleantech Special Interest Group. Tendril Networks is a 100-employee firm that makes a suite of hardware and software solutions for residential grid applications such as demand response, energy monitoring, energy management and load control. The firm offers an energy management system for consumers (based on the ZigBee HAN standard) and utilities, smart devices (such as smart thermostats, smart plugs, and in-home displays), as well as web-based and iPhone-enabled displays and energy controls. The company also develops applications for utilities such as network management, direct load control and customer load control. In June 2009, the company raised a $30 million third round, bringing its VC total to more than $50 million and making it one of the better funded private companies competing in the Home Area Network space. In the CEO's words, "Balance sheet optics and a sense of longevity are important for utilities." The average monthly American's energy bill (not just electricity) is in the $150 to $200 range. The average electric bill is about $100. But the first customers for the Tendril home energy system will likely be heavy energy users and lower-income customers, accessed through the utility. Tendril has two routes to market. The first is through the utility. Tendril's utility customers anticipate rolling out a subsidized version of their product to around 25 percent of their customers. This 25 percent comprises those in low-income programs, those with exceptionally high usage and those who sign up for demand response or load control programs. In the U.S., this represents a market of about 40 million households. The second route to market that Tendril is investigating is to reach out directly to consumers and provide a solution in the $100 to $300 price range. The CEO claims that their system routinely helps households achieve a 15-20 percent savings on their electric bill. For example, a consumer with a monthly bill of $100 would save between $180 to $240 a year on their electric bill. Tendril estimates this piece of the market to be in the neighborhood of 35 million households. So far, the company is doing well. They've won eleven of fifteen available HAN pilot deals in the first quarter of this year alone and are in the midst of shipping thousands of units. Tendril has partnered across the full supply chain in the residential smart grid -- everyone from major utilities to smart metering firms (Elster, Itron, GE, Silver Spring, Landis+Gyr) to appliance manufacturers to the big box stores that sell the appliances. General Electric's Consumer and Industrial division has teamed up with Tendril to develop algorithms and other technologies that will allow utilities employing Tendril's TREE platform to turn GE dryers, refrigerators, washing machines and other energy-hungry appliances off or on to curb power consumption. 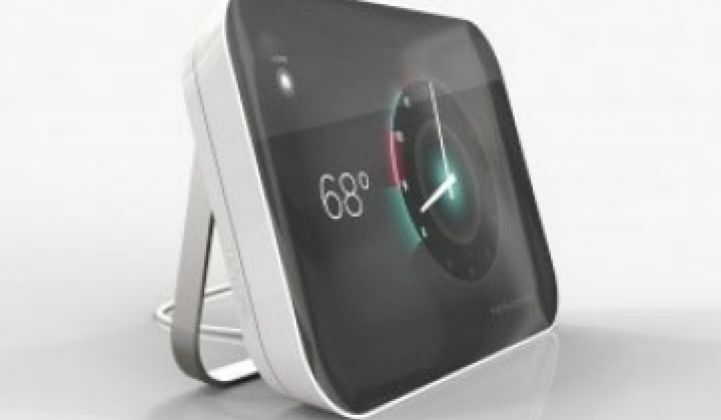 Tendril's in-home monitoring product resembles an analog clock and was developed after "spending an unhealthy amount of time behind one-way glass" observing consumer behavior in cooperation with the design wizards at IDEO. One thing that has surprised the CEO over the arc of the company is the amount of attention that needs to be paid to regulatory issues. As a result, there are three full-time employees at Tendril devoted solely to regulatory issues. Tuck's belief is that 2012 is the tipping point for the smart grid, home energy management -- and for his company. But lots of work has to be done in the interim. Other companies looking at this nascent market include Microsoft, Google, Passiv Systems, Control4, Onzo, Gridpoint and many more. Not all of them span the value chain like Tendril. As to how the recent public relations debacles experienced by the utilities with their smart grid roll-out will impact Tendril -- Tuck saw it as a positive. He believes that the utilities will now have to accelerate their projects in order to demonstrate the benefits of AMI and the smart grid to the customer.